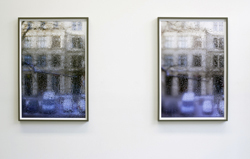 Galerie m Bochum is pleased to present from 10 May to 21 August 2013 three photographic series by Thomas Florschuetz (b. 1957 in Zwickau). At the same time Museum Wiesbaden shows a retrospective of Florschuetz's work in the exhibition Assembly (Museum Wiesbaden, until 8 September 2013). 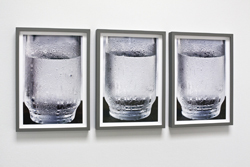 In the exhibition at Galerie m Bochum, Glas/Wasser from the 2012/13 and Untitled (K52) from 2013 are juxtaposed with the early series Multiple Entry, 1997/2008. In recent years, the artist has been occupied primarily with photographing architectural motifs all over the world. Now, his latest works have taken him back to the studio. The theme uniting all three exhibited series is the effort to capture the unique appearance of the various objects and then represent it in a picture. Florschuetz zeroes in on his subjects in extreme close-up, subverting entrenched visual habits and animating the viewer to optically scan and explore the motif. 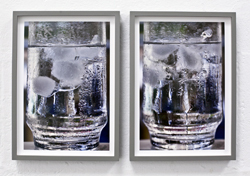 The photographs in the series Glas/Wasser focus on a glass filled with water and in some cases ice cubes. Moved close to the edge of the picture or even cropped by it, the vessel takes up almost the entire picture surface. Condensation droplets bead up on the glass, inscribing lines across its surface as the drip down and hence marking the limits between outside and inside. Although the transparent outer skin of the object holds its liquid contents within a solid body, the fragmentation caused by the framing makes this body appear more like a flat surface than a curved form. The ice cubes have their own semi-transparent physicality; in the real picture space they are in the middle field, but due to the photographic manipulation of close-up, focus and depth of field, they seem to take up the foreground instead. Glass and water reflect colors and contours in their environment, but too vaguely for the viewer to identify the setting precisely. Thomas Florschuetz investigates here the phenomena of light, color, mirroring and reflections on the technical as well as the compositional level. In the blurred areas of the background and the surface on which the glass rests, as well as in the glass itself, forms dissolve into what look like painterly surfaces. Shapes and color areas within the image create their own independent compositions. Blurred patterns of colors and shapes also feature in the images of the series Untitled (K52). These photographs show the view directly out of Florschuetz’s frozen and slowly thawing studio window. In some pictures the ice forms a craquelure pattern on the glass, or the view outside through the window shimmers indistinctly through a fogged surface. Outside and inside condense atop the glass, like on a ground glass screen. Florschuetz uses the same detail of the window for all images in the series. Because the shots were taken within a relatively short period of time, small but distinct changes are visible, unfurling a visual spectrum that ranges from abstract surface and monochrome gradient to dimly adumbrated spatial contours. Whereas in the “Glas/Wasser” series the gaze is directed at, and into, a physical object, in this second group of works on view in the exhibition the eyes wander instead from interior to exterior. The interpenetration of the various levels of the pictorial space, the alternation between figuration and abstraction, the obstructed view and partial opening, as well as the fragmentation of the motif characterize every single work in these three series. The photographs offer fresh perspectives on the objects examined while creating independent image spaces. In all three groups of works, Florschuetz explores the phenomenon of how objects in his immediate surroundings appear to the eye and how this appearance can be translated into a pictorial representation by means of photography.